I decided to research my Pavliskovec line. I wanted to find the parents of Josef Fabian Pavliskovec. By the way, I do not really know if the surname might actually be Pavliskovič. It seems like it is most commonly spelled Pawliskowetz in the Frenštát records. An appeal to kdejsme (modern surname density mapping program) yields nothing; maybe the surname died out. 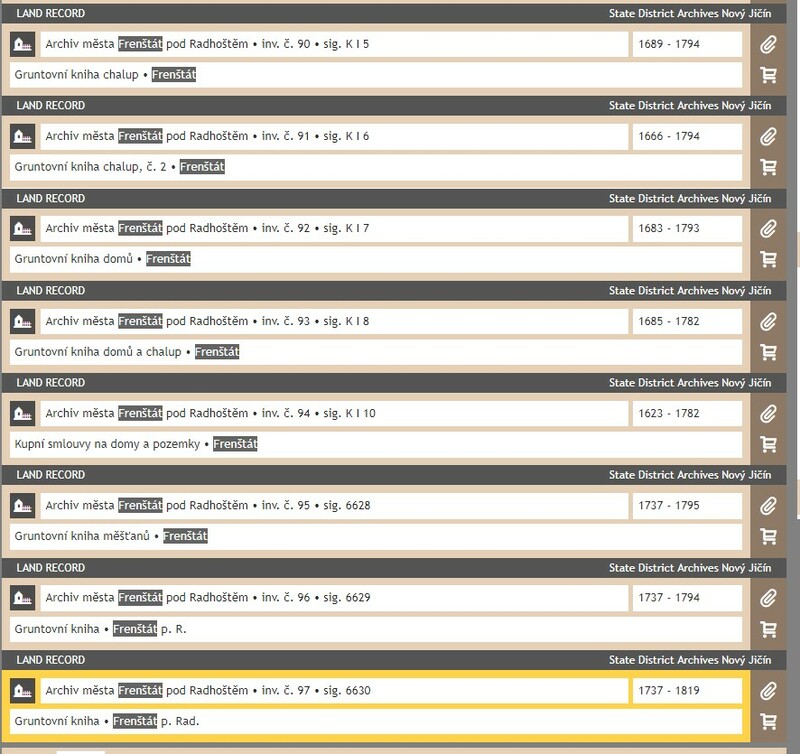 I have spent so many long hours flipping through this one specific parish register for Frenštát, number 1391, that I decided sometime last year that it would be more efficient if I indexed it. Being a huge dork, I wanted to see if I could gather additional data from comparing the sponsors, so I decided to also index them. I am 80% finished with fully indexing all the births in this register, which is some 4,500 births. I am only about 2% through with the marriages and 5% with the deaths. I hope to use this data to extrapolate lots of additional data about this town where so many of my ancestors are from. I also intend to share this index on this blog. But in the meantime, why not use this tool that I’ve been creating? I “cleaned up” some of the data by standardizing the surname spellings. After a while, you become pretty familiar with the families in one town. Granted, this is not a small village, but a rather sizeable town, so there are quite a few families to distinguish from one another. Anyway, I very quickly searched through my spreadsheet and found my Josef Fabian Pavliskovec’s birth record, along with the births of his siblings. These children were all born to Josef Pavliskovec and Anna. Notice that somebody from the Šrubář family was a witness for every single birth. Then, I soon realized that there was another group of births for someone named Josef Pavliskovec and Veronika, half of which had a Šrubář as a witness. Copy and pasting cells from google sheets to google docs causes annoying formatting issues. Just ignore it for now. The birth dates for these couple groupings do not overlap; i.e. Josef and Veronika were not having children at the same time as Josef and Anna. Could Veronika have died after the 1754 birth of Anna and her widower husband Josef remarried before the 1758 birth of my sixth great grandfather, Josef Fabian? Definitely possible. 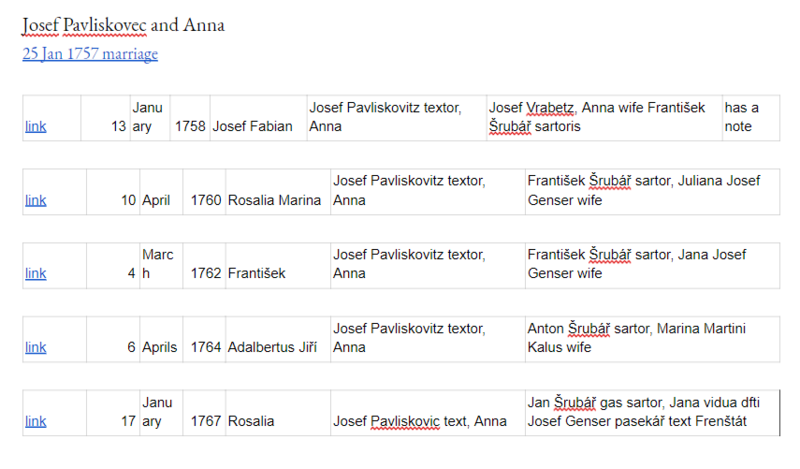 I tried to find a marriage between 1754-1758 in Frenštát for Josef Pavliskovec and Anna x, but I could not find it. I decided to look in the pozemkové knihy to see if there was anything there about this family. I first tried looking in č. 95 Gruntovní kniha měšťanů. There was no index but in my notes about the Frenštát land records (which eventually I will also share) I had written that this book is organized by house number. I leafed through the pages and discovered that it only goes up to house number 39, whereas it seems from the matriky records that this family was (at least at one point) living in house number 65. Then I looked in č. 96 Kupy chalupnické i gruntovnické svobodného miesta Frankstadtu because I had noted that there was an index in the back. However, there were no Pavliskovec’s in this index. Next I went to č. 97 Kupy chalupnicke, a gruntownicke and hooray, there was an index with a Josef Pavliskovec entry! Because this land book is from 1737-1819, I knew it was most likely for Josef Pavliskovec (my seventh great grandpa) or his son Josef Fabian Pavliskovec (my sixth great grandpa). I tried to find this entry in the book, but it starts on page 675. It actually also starts on page 7. Two sets of page numbers, ach jo. But the index in č. 97 could not have been referring to pages in book č. 95, I thought. Maybe it was referring to book č. 96? I went back there, and noticed that it was also organized roughly by house number. But since I remembered that there was no Pavliskovec’s in that index, I decided to maybe try an earlier volume. I should mention, I had really low hopes that this would work. In the catalog, I noticed that the first book which was also a “chalupnický” book was č. 90 Gruntovní kniha chalup. So I decided to search there. On this large view, č. 97 is called simply Gruntovní kniha, but when you click on it, it is called Kupy chalupnicke, a gruntownicke. At first, I found nothing because I was looking at the upper corner set of page numbers. Then I tried to look for page 597 on the lower set of page numbers, and I found the record I was looking for! I would not have ever found this if it were not for the index in č. 97. This book is 993 pages long! I was really, really happy. I then went on to transcribe the record and translate it, by myself, in a pretty short amount of time. I felt really proud of my success in doing this. It was great to see how studying Czech can help me in my genealogy research. No, I did not get every word exactly correct, but I did get about 75% of the words, and though my translation is a little bit rougher than I would like, I know the meaning. Clear handwriting. Short record. Really ideal for a land record transcription project! 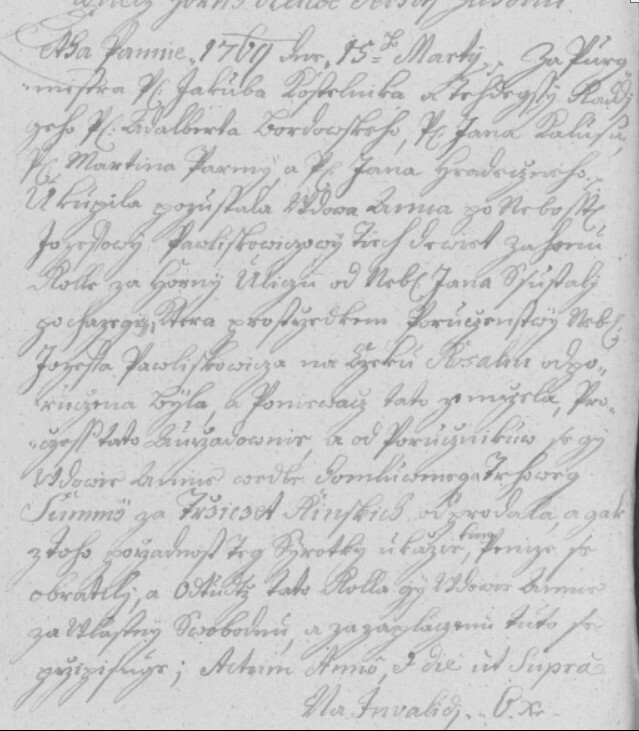 Basically, in this 1762 record Josef Pavliskovec is buying two plots of land from his wife Anna’s deceased father, Jan Šustala, for 40 fr and 6 fr 50 xr, respectively. This land was on horní ulice in Frenštát, which still exists. By 1762, Anna Šustala’s father was dead. Two pages later is another really interesting record which I transcribed. Still very clear handwriting. With more proficiency in recognizing pády (Czech declensions) it will probably be a lot easier to understand what is going on. By 1769, Josef Pavliskovec is dead. Somebody named Rosalia was supposed to inherit Josef Pavliskovec’s property. But she did not because she died before 1769. The land went to Anna, widow of Josef Pavliskovec. The land used to belong to Jan Šustala. 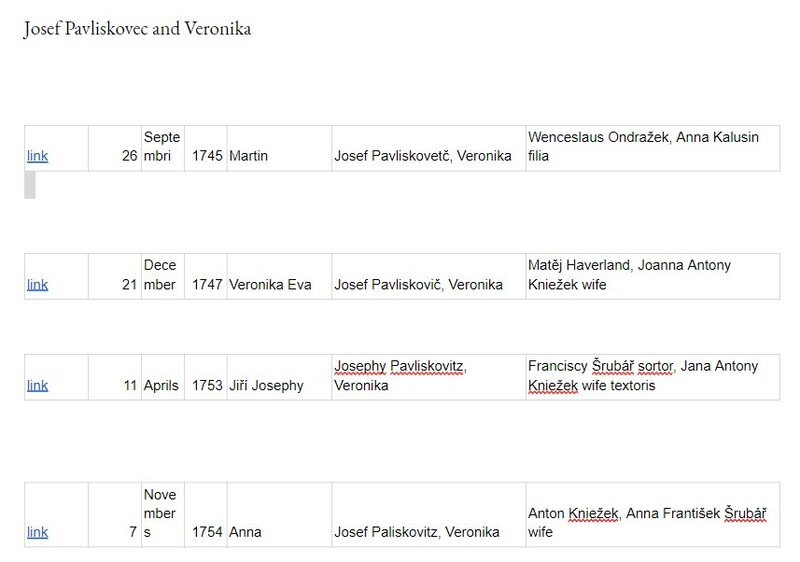 If Josef and Veronika is the same as Josef and Anna, then he married Anna Šustala sometime between 1754 (birth of last child with Veronika)-1762 (when he inherited this land from his father in law). Josef Pavliskovec died between 1767 (birth of last child with Anna)-1769. Anna, born Šustalová, inherited the land that was originally her father’s. I posed a question about this Rosalia person on the Czech Genealogy Facebook forum, and some Czech speakers confirmed my hypothesis about what was happening in this record, which felt good. They also corrected some of my Czech, which was very helpful, and which I really appreciated. I thought to myself, why can’t I find these records in the matriky?! 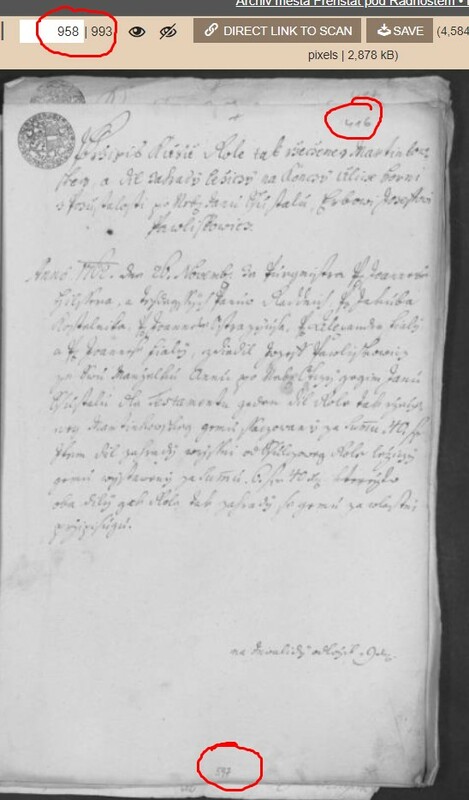 I found the marriage of Josephus Pavlisko to Anna daughter of Joannes Schustala in January 1757. Notice that there was a Šrubář as a witness. Notice that he is a widower, which fits the hypothesis that he was the same guy who married Veronika before 1745. 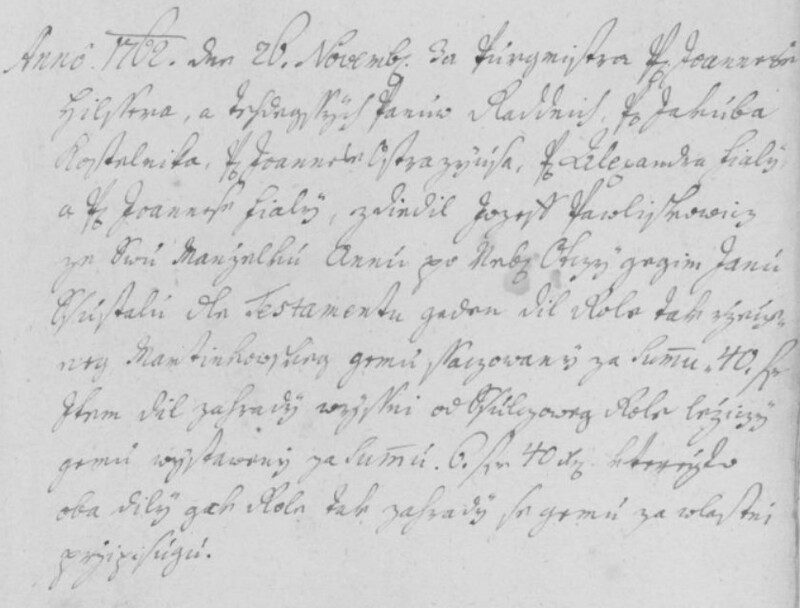 The purchase contract in 1762 says that Jan Šustala is dead. It fits with the wording on the 1757 marriage (Jan is not mentioned as being dead there) and the fact that it seems to have taken some time for Josef to have received. I hypothesize that Jan died sometime right before 1762. The first birth of Josef and Anna is in 1758. Then I found the marriage of Jan Pavlisko and Veronika Schvrčina in February 1744. This is Jan son of Josef ← but could it be a “typo”? The 1757 marriage says Josef was a widower, so he had to be married previously. I quickly found the death of Josephus Pavliskovitz in 1768, age 50. This gives him a birth of approximately 1718. The matriky for Frenštát start in 1720. I looked through the entries from 1720-1725 but only found one which might possibly be him. 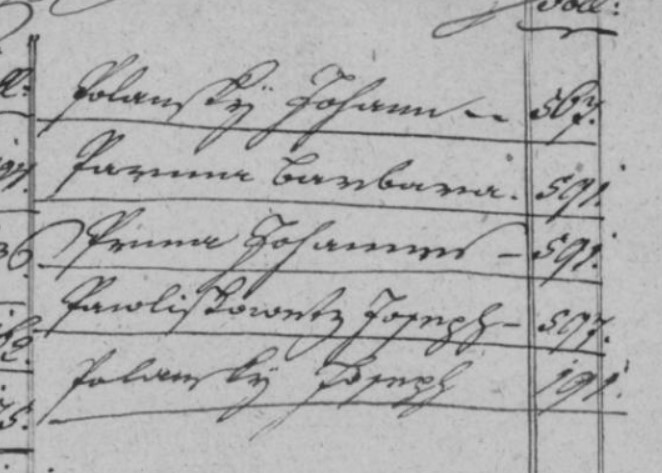 However, the father there does not match the 1744 marriage which implies that his father was Jan (even though there appears to be a “typo” in that record, which makes one wonder about its reliability at all). In general, I think I will have to wait to discover the identity of Josef Pavliskovec’s father (my eighth great grandpa), but I am thrilled to have successfully used the land books to test and provide compelling evidence for the identity of my seventh great grandpa. I am excited to gather records for his children and their spouses. The land records can provide additional evidence about the vital information of our ancestors. Sometimes the land records have an index that is located in an unexpected place, perhaps even cataloged 7 volumes away, with additional indexes in the interspersed volumes. Get to know your specific records through guessing, trial and error, observation, and careful note taking.